I’ve previously mentioned that I’ve been looking for different ways of giving myself a kick up the jacksie when it comes to putting pen to paper and drawing. Another good way I’ve found is to sign up to courses or sessions that might be based around something that I might not have thought about doing. The House of Illustration, as well as being an excellent gallery, runs quite a few of these. With that in mind I recently went to spend an afternoon listening to and then drawing with a reportage artist called George Butler. There’s nothing quite so inspirational as coming into contact with someone who is brilliant at what they do and George has talent to spare. He’s spent the past decade travelling those parts of the world that the majority of us only know from the news – Afghanistan, Gaza and the West Bank, Syria, Mosul and so on. While there, he has drawn the world as he has found it using his preferred tools – pen nib, ink and watercolours. In a time where everyone carries a camera and it seems that nothing happens without being recorded I think we can very easily be desensitised by an overload of images. I think this becomes all the more relevant when it comes to the events in far flung corners of the globe, where the people may look different to yourself and speak a different language. It’s so easy to mentally shut out the reality and subconsciously file the things we see on the news away in the same place in your brain as the last Hollywood blockbuster you saw. But by using illustration, George and artists like him, cut through this and create images that require us to engage with them. For me, George’s strength is his use of space and almost more importantly white space. The gaps between the details. By focussing on certain things while leaving other items or people unfinished he does three things: he draws the eye to exactly where he wants you to look, he makes the viewers mentally fill in the gaps creating an deep level of engagement and finally he creates a sense of a fleeting moment. 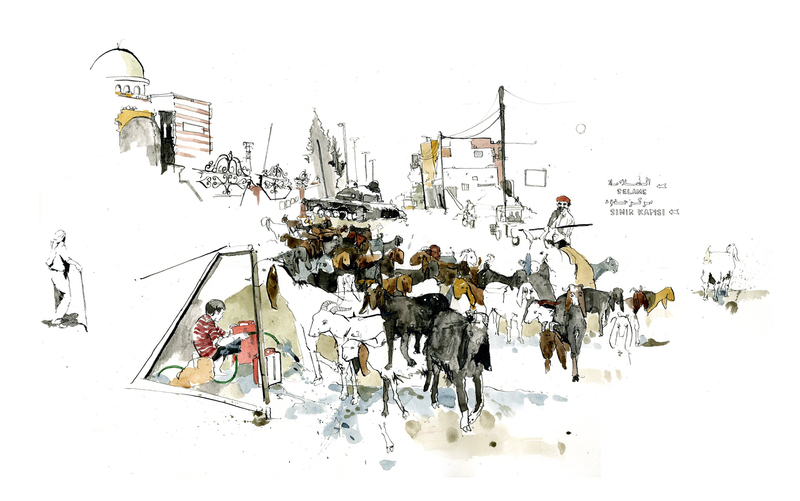 Here’s an example where he has drawn a herd of goats being driven through the streets of Azaz, Syria. His choices of where to use colour has given the composition a strong eyeline that leads you to the tank in the middle distance. There is destruction here, but George has not shown this in great detail. Instead the key to the image is the juxtaposition of the people and animals going about their daily lives and the violence inherent in the presence of the tank. ©2017 George Butler. All rights reserved. Imagine if this were a photograph, would you be drawn to look at the goats? Would you notice the tank looming in the street? Or would you be lost in the rubble of the streets? Obviously a good photographer has an eye for composition and a knack for story telling, but I doubt they could be able to achieve what George has with this image. I don’t want to post lots of his work here because he has a great website which I urge you to visit to see it in a better context. There you’ll find lots to see and read and it is worth a little bit of anyone’s time. So what happened on the day? Well after listening to George talk through his career and processes we wandered out as a group to Kings Cross station to do a bit of people watching and sketching. This isn’t something I’d usually do as I don’t like the idea of people watching me drawing – asking to see what I’m up to etc. But two things to say about this: 1/ Kings Cross is busy and the people are all more concerned with whatever it is they are up to and 2/ When it does happen that people want to chat and be nosey, like most things you’re worried about, it’s not as bad as it is in your head. I didn’t worry about creating a beautiful tightly finished work of art; I wanted to just sketch. I tried to work fast and capture moments rather than a facsimile of the scene in front of me. For example, there were lots of people wandering around using their smartphones and rather than just draw a person on their phone in the world that surrounded them, I decided to draw them then move on to the next one. So my composition of ‘phone zombies’ never actually existed but, as far as I was concerned, captured the feeling of masses of blinking people staggering off their trains, glued to their iDevices. I found working fast a challenge, but at the same time enjoyable. This drawing was a quick pencil sketch of a couple that briefly sat down to (maybe) enjoy a McDonalds and next to them was another of our drawing group. They were constantly moving (fries to mouth etc) and they weren’t there that long. The thing that pleases me most about this drawing is how little there is in terms of marks made to show a girl with a pony tail, sat cross-legged drawing the scene in front of her. I think I’ve conveyed that better in a few marks than the more complex figures of the couple. Also, rather than just drawing with one pen, just concentrating on what I was seeing, I took a selection of pens with me. I wanted to use different types of pen to play with line thickness and texture of the strokes I could make. Here the mark making became almost more important that any sense of accuracy. So I’ve got a pile of sketches that it could be said are pretty low quality, but I think it was a really productive afternoon. It reminded me of the first time I did life drawing as a 16 year old; we were made to draw with twigs and ink in order to make us stop worrying about perfection – when you draw with a twig you’re never 100% in control. Wandering around Kings Cross I had no control over the rain showers that would send the public scurrying for cover, no control over how long a person would stand in one place and no control over my subjects wanting to see what I was up to. I plan to draw from life more often, to get out of my comfort zone. Obviously I haven’t yet! But I will. Great post Matt, and I’m liking seeing you sketch in a different way to your usual style, you’ve captured a ‘moment’ really well… do some more!